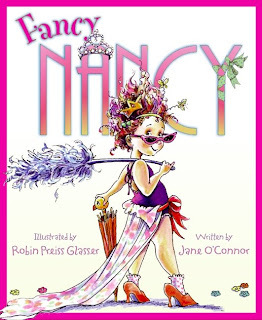 superdumb supervillain: Fancy Nancy is an absolute DOLL! 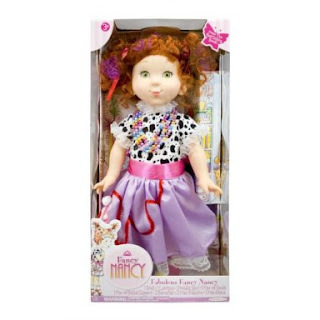 Fancy Nancy is an absolute DOLL! 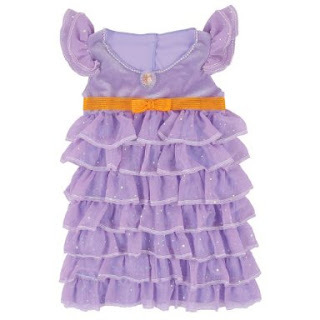 Roo is pretty fancy, as four year old girls often are. When I borrowed Fancy Nancy from the library, she felt as though she had met a kindred spirit, curly locks, crazy clothes and all! 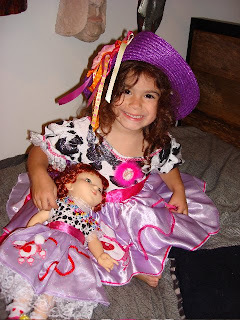 So imagine how thrilled she was to discover that Jakks Pacific, makers of her beloved Girl Gourmet Cupcake Maker, also make a gorgeous Fancy Nancy doll AND a whole stupendous line of super-duper fancy accessories and dress up clothes for both doll and owner. Yes, Roo was pretty thrilled, to say the least! And so was Jasper. 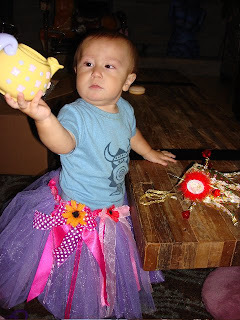 He's a bit young to realize he shouldn't submit to his sister's every whim yet, so he's game for the tea party, too. I keep seeing these dolls all over, and I love the coordinating kid and doll clothes. I should get one for my goddaughters and niece for Christmas. My brother used to beg me to help him dress up as a queen. I mean he was like 4. Not now or anything. Oh, no way! I keep hearing about how I need to check those books out from the library. That's it, if you say you loved them, we're on it.